SAN PEDRO — Boaters in search of some land-based activities this summer can head to San Pedro’s waterfront, where a number of new activities — along with some fan-favorites — are planned. Two new attractions on the list include the now-open “Crafted at the Port of Los Angeles” marketplace, and the July 7 grand opening of the 887-foot battleship USS Iowa, which will be operated as a museum. San Pedro’s massive Warehouse #10 on East 22nd Street has been transformed into an arts and crafts marketplace, where more than 100 artists have set up displays and booths on the open-floor area. Dubbed “Crafted at the Port of Los Angeles,” the marketplace opened June 29 with a ribbon-cutting ceremony, live music and refreshments. Once the adjacent Warehouse #9 is renovated, “Crafted at the Port of Los Angeles” is expected to house more than 500 artists and merchants in its 135,000-square-foot area, and bring more than 500,000 visitors to the waterfront. The World War II-era warehouse sat unused for several years, and port officials decided the area could be utilized as an artist-friendly venue without having to drastically renovate the wood-frame building. “Crafted at the Port of Los Angeles:” The large-scale permanent craft marketplace features a collection of local artists, original designers and artisanal food makers every weekend. USS Iowa Battleship Grand Opening: Built in 1940, USS Iowa (BB-61) served in the Navy for more than 50 years. Known as the “Battleship of the Presidents,” the high-speed ship was equipped with big guns and heavy armor. USS Iowa is now being transformed into an interactive and educational museum. When: Grand opening: 9 a.m.-5 p.m. July 7. Open daily thereafter. 24th annual Taste in San Pedro at the Port of Los Angeles: This year, the popular event will be held at Ports O’ Call Park on the south end of Ports O’ Call Village. The Taste features food from 30 local restaurants, wineries, breweries and merchants, as well as live music and craft booths. L.A. 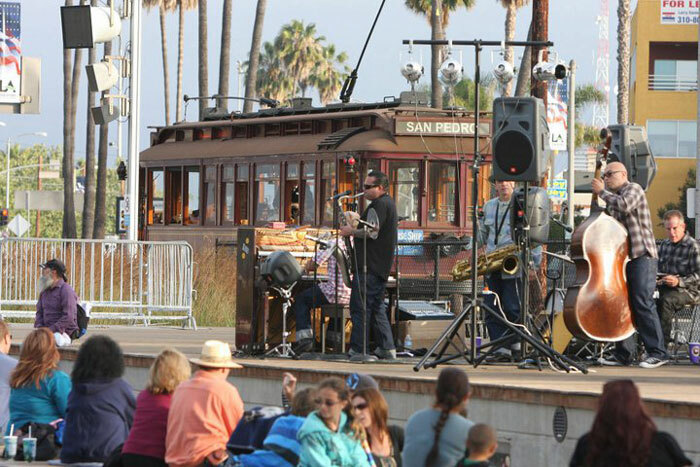 Waterfront Summer Concert Series: The port’s second annual summer outdoor concert series will take place on Thursdays at Gateway Plaza Fanfare Fountain, located at Harbor Boulevard and Swinford Street, south of the Vincent Thomas Bridge in San Pedro. The free series will feature a different band and genre of music each week. This year’s lineup includes Stack of 45s, Rumble King, Heartstop, Satisfaction, Sugah Daddy, Britain’s Finest, The Pinheads, Christopher Bros. and Reality Check. Family fun activities are scheduled from 6-7 p.m. and the concerts start at 7 p.m. Note: Aug. 2 concert will take place at the Wilmington Waterfront Park. Navy Days L.A.: The Port of Los Angeles’ World Cruise Center will serve as a “naval base” during this special weekend for Navy Days L.A. Visitors will get the opportunity to board and tour active Navy vessels and meet the crews. Specific ship information and tour times will be available on the port’s website Aug. 1. Port of Los Angeles Lobster Festival: The world’s largest lobster festival is scheduled at Ports O’ Call Village in San Pedro. With fresh Maine lobster flown in daily for L.A. waterfront dining, the festival has been a South Bay tradition since 1999. The event includes live music, games, rides, food and fun for the entire family.